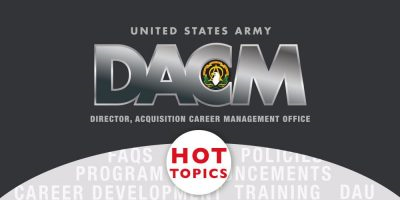 The Office of the Assistant Secretary of the Army for Acquisition, Logistics and Technology (ASA(ALT)) and the U.S. Army Acquisition Support Center (USAASC) Army Director for Acquisition Career Management (DACM) Office continue efforts to develop and staff an Army Acquisition Workforce (AAW) Human Capital Strategic Plan (HCSP). Human capital planning is our systematic and collaborative process for looking forward to anticipate workforce gaps and provide solutions to recruit, develop and retain a highly skilled, engaged AAW over the next five years. Ongoing efforts include final design of the HCSP for staffing and approval in April 2016, and then communicating and collaborating on the HCSP with the AAW. The corresponding action plan is also under development for implementation after approval of the HCSP. The data call for the Defense Acquisition Workforce Development Fund (DAWDF) FY17 Plan is open until May 18. Army commands and organizations may request funding to develop initiatives that support the Army acquisition executive’s strategic objectives. Consider efforts that will improve certification rates among your acquisition workforce, develop functional and leadership skills, increase acquisition core competencies and recruit, retain and recognize acquisition workforce talent. Funding approval will be prioritized and allocated according to Army acquisition and organizational priorities. On April 25, the Army DACM Office will be providing a Senior Rater Potential Evaluation (SRPE) Socialization and Training Briefing to the Army Acquisition Workforce at the Aviation and Missile Command (AMCOM). The Bob Jones Auditorium will be utilized to enable maximum participation. 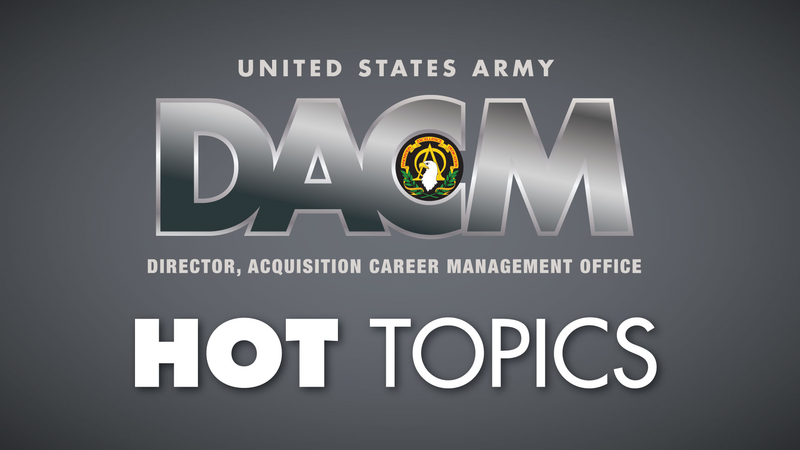 POC: Ms. Angela Williams (angela.g.williams18.civ@mail.mil) , AMCOM G-3, Training and Career Management. The announcements for both the Naval Postgraduate School Master of Science in Program Management (NPS-MSPM) and the Naval Postgraduate School Master of Science in Systems Engineering (NPS-MSSE) are open until April 11. Advanced Civil Schooling – The application for FY17-01 is currently open and will close on May 3. The program start date for this group is between Oct. 1 and March 31, 2017. The 4th Quarter Announcement for the Acquisition Leader Challenge Program (ALCP) opens on May 2. This is an excellent leadership development seminar series for levels GS-7 through GS-15 (3 different courses). Visit the program page for further details. The Acquisition Tuition Assistance Program (ATAP) application opens on May 9. The application for the Defense Civilian Emerging Leader Program (DCELP) opens on May 3. The program is open to permanent (non-temporary/non-term) Army Acquisition Civilians GS-7 through GS-12 and broadband equivalents who have met their current position certification requirement. The announcement for the Competitive Development Group/Army Acquisition Fellowship will open in June. Please stay tuned for further details. The FY17 DAU course schedule will be available for student registration on Tuesday, May 17, 2016. Students should take some time now to review the required prerequisite(s) in the DAU iCatalog and complete them prior to registration for an FY17 course. Planning ahead will ensure timely completion of DAWIA certification requirements and enrollment in the desired course(s). Then, the Army DACM Office highly suggests students apply early to have a better opportunity in obtaining a class in the required timeframe. In addition, encourage your supervisor to approve your training request as soon as you apply.